Did you know that it was a Chislehurst house builder, William Willett, who first proposed daylight saving hours in this country? When most people lived in agricultural communities, the sun rising earlier in the summer than in winter had not been a problem as people just shifted their habits according to the daylight. But by the end of the 19th century more people were living in towns and cities and working in offices and shops, and their daily routines were determined by the clock. On his early morning horse rides over Chislehurst Common William Willett noticed how many window blinds were still down. He realised that warm spring evenings were being wasted because it got dark early, so he came up with the obvious solution – to change the nation’s clocks, and in 1907 he wrote a pamphlet, ‘The Waste of Daylight’. This would also benefit golfers playing in the evening (he was a keen golfer!). But it took nine years and a world war to persuade the Government to adopt his proposal. In 1916 an emergency law was passed to change the clocks twice a year, increasing war production, and this became permanent by the passing of the 1925 Summer Time Act. Sadly William Willett died from influenza in 1915 before his idea was enacted. He is buried in St Nicholas Churchyard, Chislehurst. There is a blue plaque on the wall of his house, The Cedars and a Willett Memorial sundial in Willett Wood. There is even a pub named after him in Petts Wood, the Daylight Inn. It’s worth mentioning that the link between Blackfen/Sidcup and Chislehurst was once much stronger than it is now. The A20 cut them adrift, but large areas of Blackfen were owned up to 1915 by the Townshends of Frognal and Scadbury. Dominating the north west part of Blackfen used to be The West Wood, a surviving section of much more extensive ancient woodland. In the 1200s it belonged to the Lord of the Manor of Bexley, the Archbishop of Canterbury. It was valuable, providing wood for fences, poles and gates, logs for fires and charcoal for fuel, and a great pond was stocked with 4000 fish. In earlier times local tenants would have taken their pigs to feed in the woods, but in 1284 there were complaints that the Archbishop of Canterbury’s systematic use of the woodland had taken away their ancient rights. Labourers were employed to cut the wood and a ‘woodward’ was in charge of selling the wood to shipmen, coopers and brewers, transporting it overland to Woolwich or Erith to be sent up the river to London. The aerial view below (dating from 1932) shows the proximity of the River Thames (across the top). Also below are images of the Thames at Erith. After the Reformation, ownership of the West Wood passed to Henry VIII. After being passed around a few times it was granted in 1621 to the University of Oxford to provide endowment for a professorship of history. By 1854 foreign imports of timber had made the woodland unprofitable and all the trees were dug up so the land could be used as a farm instead – Westwood Farm, which remained until 1930s housing redevelopment. On St Patrick’s Day, let us remember the most prominent Irishman in Blackfen’s history, Michael Heaslip, who was born in Newmarket, Co. Cork and came to England with his young family in the 1890s. He worked as a haulage contractor in north Woolwich and he bought a farm in Blackfen as grazing for his horses which he liked to use as his weekend retreat! His son, also Michael, served at the Woolwich Arsenal during WWI and his picture (see below) was part of the WWI display at Sidcup Library. The farm was sold off for 1930s housing development, but Our Lady of the Rosary Roman Catholic Church was later built on land next to the site of Heaslip’s farmhouse. The Catholic Church was in high demand in the 1930s while house-building was active in Blackfen as there was a large Irish population who came to find work. And when Irish people in Blackfen married their weddings were often announced in Irish newspapers. The Ballina Herald reported on 14 April 1951 the marriage of John Bradley, only son of Mr and Mrs John Bradley, Glasgow, to Breedge, youngest daughter of the late Mr John Granahan and Mrs Mary Granahan, Creevy, Castlehill, Ballina, which took place on Easter Monday at the Church of the Holy Rosary, Blackfen Kent. Meanwhile the Irish Independent of 20 November 1962 p13 reported the marriage (pictured) of Mr Thomas Sullivan, Rosmuck, Co. Galway and Miss Elizabeth Dunne, Sidcup Kent, who were married in the Church of Our Lady of the Rosary, Blackfen, Kent. Today would’ve been my dad’s birthday so I was thinking about 1962 – the year he moved to Blackfen from Wandsworth. With his job as an overseas telegraph operator he had saved enough money to get a mortgage on a house in the tree-lined East Rochester Way. What did Blackfen look like in 1962? Although my dad was a keen photographer he took virtually no photographs of Blackfen which is rather annoying! Wally Racher, shoe repairer was still in his cabin near the Jolly Fenman, from which he would regularly emerge to see school children across the road. There was a grocery store at 10 Blackfen Road (now converted back to a house), and a newsagent/Post Office at the corner of Fen Grove. In the centre of Blackfen you could find Jackson’s greengrocers, Lintorn Butchers, the Corn Shop, Homepride, Woolworths, Lipton and Sylvia’s Cafe as well as the still familiar names J. Ayre bakers and Copelands the newsagent. One of my dad’s favourite shops was Corbett’s timber merchant and his favourite pub was The Jolly Fenman. The library was in an austere building in Cedar Avenue. The Odeon Cinema in Westwood Lane had been closed for years but the derelict building still stood in 1962. (Shortly afterwards it was demolished and replaced by Safeway). The A2 flyover had not yet been built and there was just a crossroads with a set of traffic lights. It was in 1969 that the Rochester Way was widened and the grass verges were lost. 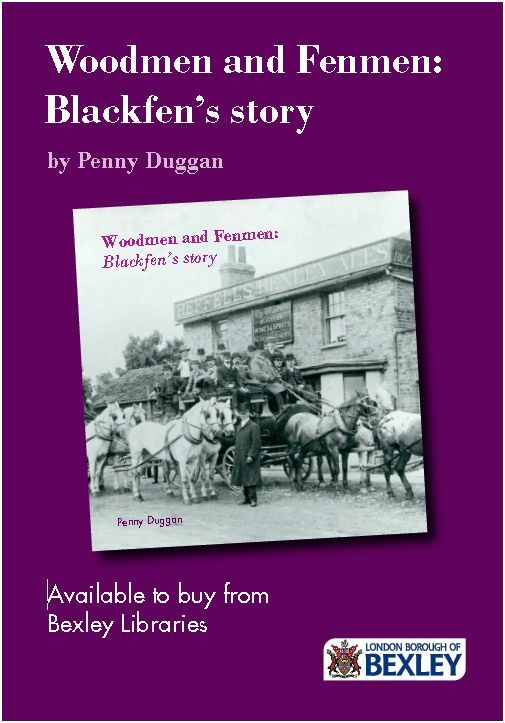 There are quite a few photographs from this era in my book ‘Woodmen and Fenmen: Blackfen’s Story’ which you can borrow or purchase from Blackfen Library. It was because of my dad that I wrote the book – I wanted to know why he (and all the other people who came here) chose Blackfen as the place to make a new life. Yesterday I visited the ‘Slavery, culture and collecting’ exhibition at the Museum of London Docklands which investigates the relationship between European culture and transatlantic slavery. It’s an uncomfortable truth that many ‘philanthropists’ commemorated for their associations with charitable causes generated their wealth from slavery. And Blackfen is directly affected by this. Danson House was the lavish country home of Sir John Boyd who owned sugar plantations on St Kitts. He acquired the freehold of Danson Hill in 1759, had a new Palladian villa built and set about greedily acquiring parcels of land to enlarge his estate to display his wealth and social status – this took the boundary up as far as Westwood Lane and south of Blackfen Road, including the cottage which became the ‘Chapel House’. He travelled abroad, purchasing works of art for his villa. In later life he focused ‘on religious subjects and good deeds and administering local charities’. Neill Malcolm inherited the Malcolm family fortune made in Jamaican sugar plantations and through marriage inherited Lamorbey House (now Rose Bruford College) in 1812. He extended Lamorbey’s estate by buying up surrounding parcels of land. The Malcolm family went on to endow the chapel at Holy Trinity, provided land for a new vicarage, supported the church school in Hurst Road, established another school in Burnt Oak Lane and built cottages for workmen. Although the family moved away from the area, it was Lt-Col G. I. Malcolm of Poltalloch, a descendant of the Malcolms of Lamorbey, who laid the foundation stone for the Church of the Good Shepherd in Blackfen Road in 1967. Once the Christmas excess is over [I say as I’m tucking into a Chocolate Orange! ], will you start to think about New Year’s Resolutions? Perhaps you’re aiming to take up more exercise? 100 years ago cycling was very popular. Cycling clubs were established and the working class found freedom on their bikes in the countryside. Of course, stop-off points for refreshments were needed, and on the north of Blackfen Road opposite Days Lane stood the Cyclists’ Rest tea room and dining salon. In the photo below which has the RACS Stores and Days Lane on the left, you can just make out the sign for ‘Teas’ on the right hand side. By the 1930s the residents of Blackfen cycled out of necessity rather than pleasure, as it was cheaper than paying for trains or trams. Garth Groombridge sold bicycles from his home at the Chapel House. In Blackfen Road close to Sycamore Avenue, Alfred Lockyer had a shop selling bicycles and electrical goods, and opposite was Wrights’ radio, cycles and electrical. Charlie Ryan had a cycle shop at 21 Wellington Parade (later Argent’s, and in 1974 it became Garozzo; it is now Sondel Yamaha). Bicycles were also used in the 1930s for deliveries of newspapers and bread, and tricycles were used to sell ice-cream. A Cycle Speedway was set up on a field next to Blackfen’s cinema in Westwood Lane around 1951. The Blackfen Wheelers Cycling Club was formed in 1952 and their club runs into Kent, Surrey, Sussex and Essex started at the Woodman Inn. But both had folded by the late 1950s. Blackfen’s Christmas event takes place on Saturday 8 December at Blackfen Community Library: Christmas Choir from 12pm, Christmas crafts and face painting from 2pm, Santa’s Grotto 2.15-4.15pm. And at 4.30pm the Mayor of Bexley will switch on Blackfen’s Christmas lights. Don’t miss it!